A mission chapel for the part of Crawley town in the parish of Ifield was built in 1880, designed by Somers Clarke junior (VCH 6(2) p70), before he worked on Ifield church. The chapel must have been modest, for it was replaced in 1892-93 by a larger one, designed by W H Nash (B 133 p1004). This is plain with a north aisle and is finished in rough stone. The windows are lancets, some in pairs, and there is a stone belfry and a lean-to west porch beneath it. The high-roofed brick-faced interior is barely interrupted by the almost equally tall chancel arch and the stone arcade has oblong piers. 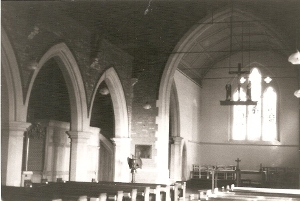 The original fittings have gone as part of a re-ordering which was completed in 1991 (church website). As a result, the altar was moved to the west end of the chancel and the west end is partitioned off behind a timber and glass screen for use as a hall etc. Rood: 1937, L Grossé of Manchester Square, London (CDG Feb 1938 p85). 1. (East and chancel side windows) P Bacon and Brothers, 1919 (WSRO Fac 3316). 2. (South aisle, first window) P Bacon and Brothers, 1930 (WSRO Fac 2237). 3. South aisle, third window) G Maile and Son, designed by A S Walker, 1949 (WSRO Fac 432). 4. (South aisle, fifth window) Barton, Kinder and Alderson, designed by F W Skeat, 1956 (WSRO Fac 437). 5. (West window, bottom) Ward and Hughes, 1887 (www.stainedglassrecords.org retrieved on 11/2/2013). 6. (West window, top) J Powell and Sons, 1969, designed by P Fourmaintraux. With abstract pieces of glass set in concrete (Order book). 7. (North aisle first and third windows) A L and C E Moore, 1925 and 1928 (signed). 8. (North aisle, second window) Barton, Kinder and Alderson, designed by F W Skeat, 1952 (WSRO Fac 434).